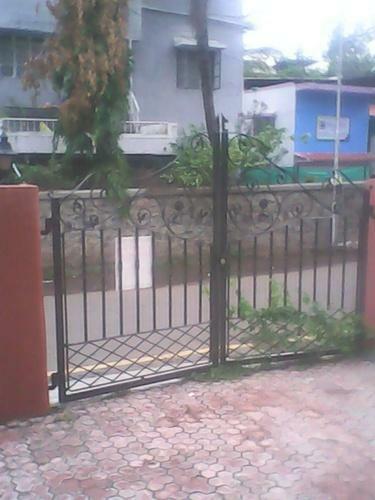 We are a leading Manufacturer of Ms Industrial Gate, MS Motorized Gate, Compound Gates, Compound Gate, Swing Open Compound Gate and Sliding Compound Gate from Pune, India. We are one of the leading manufacturer of Compound Gates which are fabricated by using high-grade raw material obtained from trusted vendors. With our able team of quality auditors we check these products for their quality, making sure that only quality products reach customers. Our Compound Gates is manufactured using superior quality rust free metal which is later on coated with Zinc. To protect these gates from external harmful elements these are further painted with enamel to increase its service life. We manufactured these gates in several artistic and modern designs to enhance the ambiance of the building. Backed by rich industry experience, we are engaged in manufacturing and supplying a high qualitative range of Metal Main compound Doors. Our offered range is precisely designed and manufactured by our team of experts using high quality raw material and advanced technology. This product is available in different specifications as per the demands of clients. Further, our offered product is bestowed with following features given below. We are one of the leading manufacturer of Swing open compound gate which are fabricated by using high-grade raw material obtained from trusted vendors. With our able team of quality auditors we check these products for their quality, making sure that only quality products reach customers. Our Compound Gates is manufactured using superior quality rust free metal which is later on coated with Zinc. To protect these gates from external harmful elements these are further painted with enamel to increase its service life. We manufactured these gates in several artistic and modern designs to enhance the ambiance of the building. We are one of the leading manufacturer of Sliding Compound Gate which are fabricated by using high-grade raw material obtained from trusted vendors. With our able team of quality auditors we check these products for their quality, making sure that only quality products reach customers. Our Compound Gates is manufactured using superior quality rust free metal which is later on coated with Zinc. To protect these gates from external harmful elements these are further painted with enamel to increase its service life. We manufactured these gates in several artistic and modern designs to enhance the ambiance of the building. We are one of the leading manufacturer of MS Compound Gate which are fabricated by using high-grade raw material obtained from trusted vendors. With our able team of quality auditors we check these products for their quality, making sure that only quality products reach customers. Our Compound Gates is manufactured using superior quality rust free metal which is later on coated with Zinc. To protect these gates from external harmful elements these are further painted with enamel to increase its service life. We manufactured these gates in several artistic and modern designs to enhance the ambiance of the building.